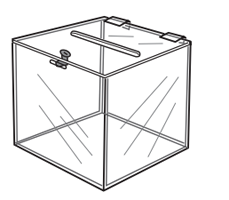 A locking ballot box, constructed of clear acrylic. Ideal for raffles, drawings or donations. Available in 2 sizes. Slot size is about 4 1/4" on each. The locking mechanism ensures that unauthorized personell cannot gain access to the contents of the bllot box. A durable construction ensures that this acrylic ballot box can handle high traffic areas. This acrylic ballot box will help collect contact information or contest entries. The locking mechanism ensures that contents are not disturbed. Ideal for elections or donations. This acrylic ballot box features a brochure holder, ideal for information or graphics. Box has locking ability, allowing you more freedom to use it as a stand alone display while remaining secure.